The oldest and wealthiest retirement plan participants are also the most pessimistic about their financial futures. 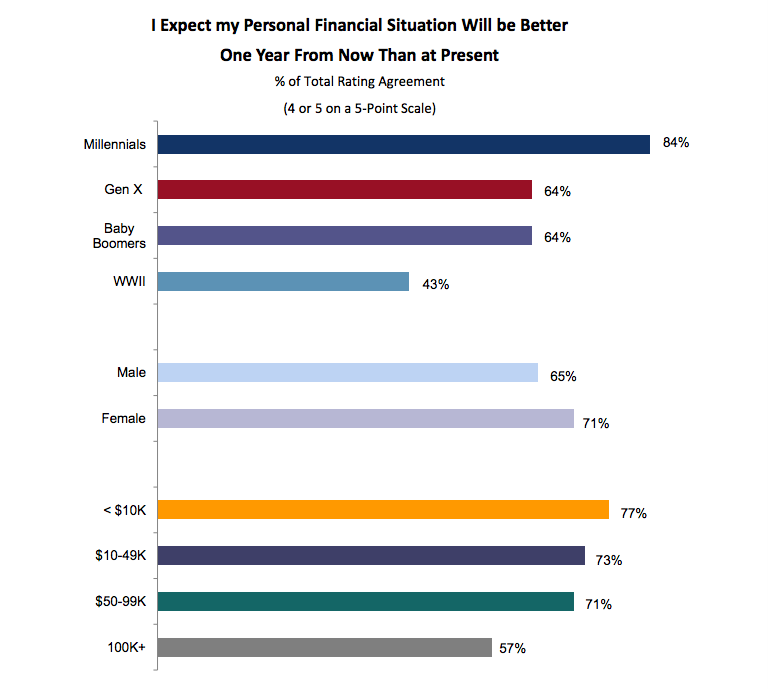 A recent report by Spectrem Group, entitled “Financial Behaviors and the Participant’s Mindset,” surveyed retirement plan participants across every wealth level and found stark divides in future outlooks along both monetary and age lines. When asked if they considered their financial situations better today than one year ago, only 52 percent of investors with a plan balance over $100,000 answered “yes,” the lowest level of satisfaction among every segment surveyed, just eeking out those with less than $10,000 invested, at 53 percent. It’s important to note that these two categories of investors, who represent opposite ends of the wealth spectrum, also comprise the two largest segments of total plan participants: 35 percent with over $100,000 and 24 percent with less than $10,000. So, nearly 60 percent of plan participants fall into the two groups that are least satisfied at the present. When the focus switches to the future, however, some separation emerges. The over $100,000 group remains the most pessimistic, with 57 percent believing that their financial prospects will improve in the future, by far the lowest confidence level. On the other hand, those with under $10,000 are actually the most optimistic, with 77 percent of respondents believing that their futures will be bright. Perhaps this phenomenon could be chalked up to those at the lowest investment level believing that they have nowhere to go but up, while those currently at the top experience quite the opposite. The study offers another explanation, however: age. The numbers indicate a more or less direct correlation between youth and financial optimism. 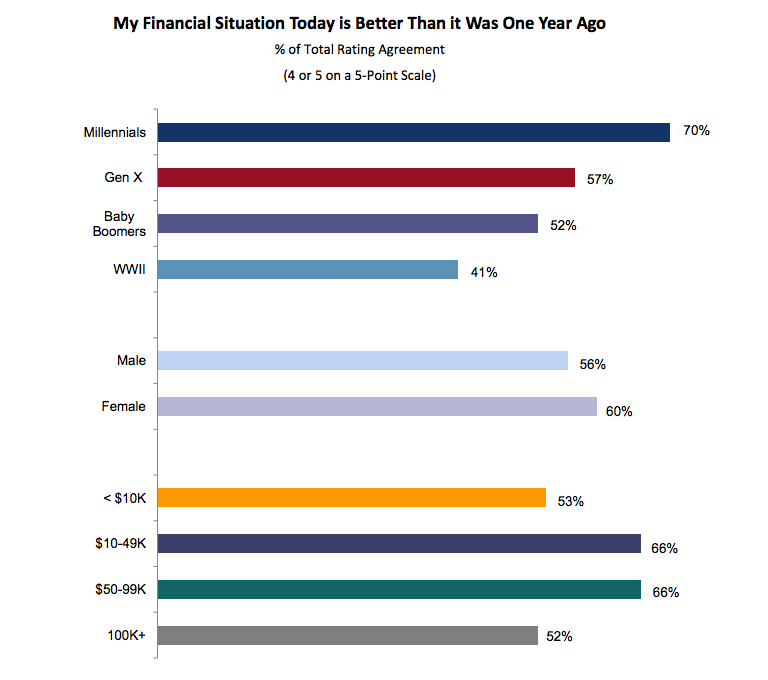 Separating the respondents into four generations — millennials, Generation X, baby boomers and World War II, millennials overwhelmingly felt that their financial prospects had improved this year as compared to last, with 70 percent answering in the affirmative. The World War II generation, on the other hand, was the least satisfied, as only 41 percent felt their situations had improved. However, since this generation only made up 1 percent of respondents, it’s probably more informative to focus on the boomers as the “oldest.” Only 52 percent of boomers answered in the affirmative. This youthful confidence continues when projected into the future as well, with millennials again having the brightest collective outlook at 84 percent. Gen X and boomers again bring up the rear, tied at 64 percent, although it does appear that these groups are fairly confident about their future prospects. So, perhaps this divide in confidence is simply a matter of time. Millennials, with their whole lives in front of them, feel as though they have plenty of time to improve their prospects, while older generations, who are staring down the barrel of retirement, may be feeling the pressure more acutely as their prime earning years come to a close. Regardless of wealth or age, pretty much everyone seems at least a little worried about being able to retire when they want to (barring the WWII generation, who are largely already in retirement). Gen X is the most concerned, at a whopping 70 percent (unsurprising, since they were the group hit hardest by the 2008 financial crisis), but boomers and even millennials, at 58 percent and 56 percent, respectively, aren’t particularly confident about their prospects either. This pattern holds true when broken down by wealth, with even the most confident group of investors ($10K-$49K) still voicing concern at a 58 percent rate. Retirement plan advisors should take these numbers to heart and realize that even the best-off clients are experiencing pessimism and worry about their financial futures. Adopting a more holistic and hands-on approach to actively assuage these fears could be a valuable differentiator for a savvy advisor.